Welcome to the last Monday in September! It's time to announce the winners of the 'From The Heart' challenge. Thank you all of those who took the time to enter with fantastic projects again. The whole Design Team loved looking through them all to choose a winner, and this time our votes went to #13 Toni. Just look at the wonderful stencilling and gorgeous flowers adorning this heart shaped home decor piece - we loved it all! And so congratulations go to Toni, our Frilly and Funkie favourite who has won the opportunity to be a Guest Designer here for a future challenge. And Random.org has chosen a winner for our $25 gift certificate to The Funkie Junkie Boutique. Our congratulations go to #4 Pamellia. A huge vote of thanks from the Frilly and Funkie Design Team to everyone who took part in this challenge and congratulations again to our winners. Please email Linda at thefunkiejunkie@gmail.com for the codes for the winner's badge and to give us your email address for the Guest Designer details (Toni) and for the gift certificate details (Pamellia). Our current challenge, 'A Haunting Halloween' runs through Tuesday, October 7th. We hope to see you entering this time around so that you too can be in with a chance to win. And remember, you can enter up to 10 challenges including ours, and a maximum of 3 entries per person to our challenge. Please remember to link back to our challenge in your entry and mention in your post that you are entering this Frilly and Funkie challenge. 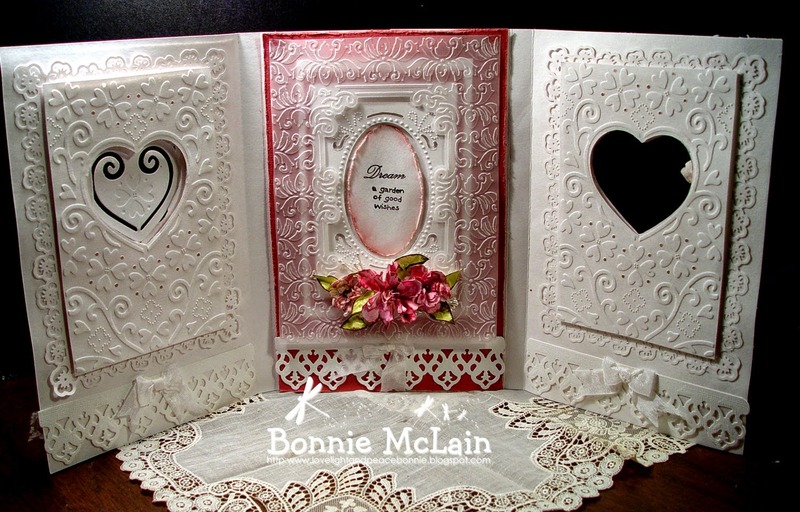 Today we are welcoming back Bonnie of Love, Light and Peace as our Guest Designer. Bonnie was chosen as the DT winner of the challenge A Summer Garden. Let's hear from Bonnie and see her wonderful project! 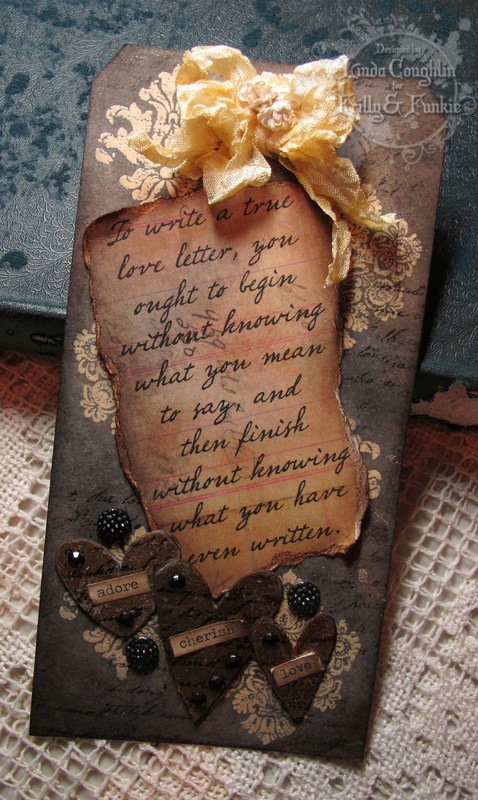 Hi, my Name is Bonnie McLain… and at times I am referred to as Love, Light and Peace… Bonnie.. (that is the way I have signed my name for a long long time now). I am very proud and Honored to be the GUEST DESIGNER today for Frilly and Funkie… this Design Team has so very much going for it… and I love the challenges… they are so very inspiring and creative that I get really excited… I love doing this Guest Designer part… but LOVE doing the challenges too… so jump on up and go start to create something for this one… SPOOKY is what it is all about… I have been in the art field for over 50 years… and have done a lot of different professional types of art, such as; Fashion design, fabric design, in New York City Garment district… Art therapy in psychiatric Hospitals; Designed and manufactured a line of country gifts that my Husband and I produced from Aromatic Red Cedar and created a Cottage Industry for over 40 people. I have designed and also manufactured a line of hand wrapped jewelry. So I have been in the art business and field for a lovingly long time. I love it now more than ever, as it is all fun and games. I presently teach and have a nice studio in my home. What could be more perfect. Doing challenges is a fun and learning experience for me in so many ways… and also meeting people from around the world. I have been on Design Teams, and also had web sites and Blogs for over 12 years now… All very exciting… I personally feel that once we stop learning and meeting others, our life will stop pretty soon… so I keep active in that area as much as possible… I do many different kinds of art even now, from knitting, spinning, felting, painting, metal wrapping, book making, Zentangling, sewing, quilting, making our clothes, basket making, journaling, all kinds of health situations, and cooking, along with canning and preserving our foods for the year. And challenges are a always on the top of the list… along with all the chores and loves of living and owning a farm… Have a fun day. I put a fence around a section, and an empty bottle… which I colored with inks and put a label on it… and a grave stone… every haunted house has a grave stone in the front yard, right???? I tried to incorporate all things that you might find around a haunted house… and there is also a little critter living there… but you will have to go to my blog to see that… Hope you enjoy this SPOOKY HAUNTED HOUSE. I'm sure you'll agree that Bonnie's haunted house is fabulous and has provided more inspiration for the current challenge 'A Haunting Halloween'. If you would like to be in with the chance to join us as a Guest Designer all you need to do is join in! Debra Reed! Debra, please email thefunkiejunkie@gmail.com with your mailing address so I can get your embossing powders winging their way to you. A huge thank you goes out to everyone who joined in the contest. There were 223 entries with all the comments, likes, posts and sharing on blogs. It was so much fun to see how enthusiastic every was over this wonderful prize. I wish I could give each and every one of you an Embossing Powder bundle! We still have some in stock over at The Funkie Junkie Boutique, as well as a few bundles of the new Tim Holtz Distress Stain Sprays. Stay tuned to our Frilly and Funkie challenge blog and our Facebook page for news on sales, give-aways and new products, and don't forget, we are back tomorrow with the launch of a brand new challenge theme. 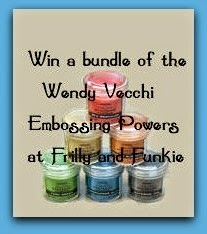 Would You Like to Win a Wendy Vecchi Embossing Powder Bundle? Note; this is a sticky post until the end of Monday September 22nd. Please scroll down to see the new Friday Focus tutorial. 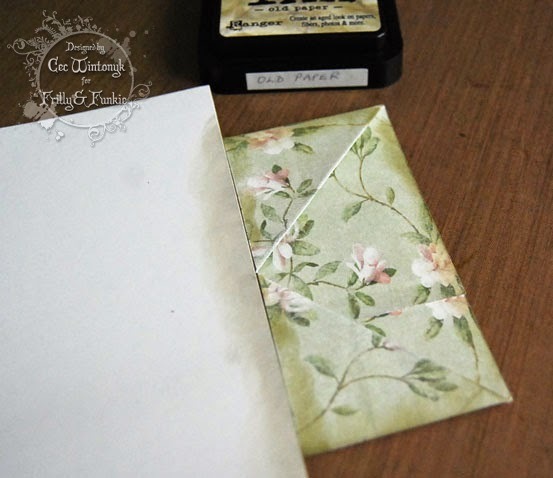 Have you seen the gorgeous new Wendy Vecchi Embossing Powders that match her archival inks? We’re celebrating Wendy’s new release here at Frilly and Funkie by giving away a bundle of all six colors. Contest ends midnight Eastern Time on Monday, September 22nd. Results announced on Tuesday. Post our store badge on your blog’s sidebar (code below) – three entries!! If you post the contest badge or the shop badge on your blog, please email thefunkiejunkie@gmail.com to us know so we can add your name extra times to the contest drawing! Good luck! 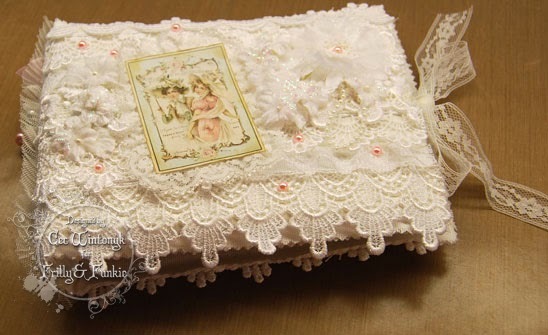 It is Cec here and today I am presenting the Friday Focus on Venise Laces and I am going to show you this lace mini album. For the next two weeks all the Venise Laces at The Funkie Junkie Boutique will be further discounted by 15% so this will be a perfect time to stock up. 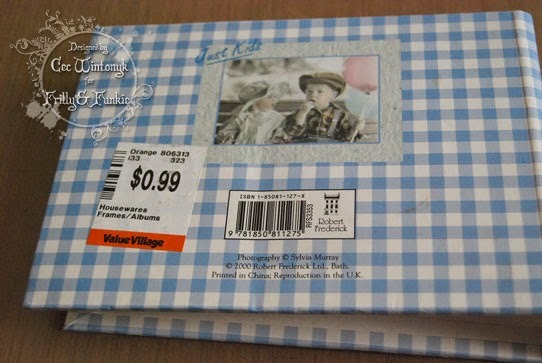 We have a thrift store nearby and I had never been inside until a few weeks ago and I found this small album for just 99 cents - what a deal and a perfect base for an album. The first thing I did was to rip out the plastic photo holders on the inside. I won't be providing measurements because each album is unique and I had to figure out every measurement based on this particular album but I will show you the process I went through. The first thing was to cut a piece of batting to cover the album. 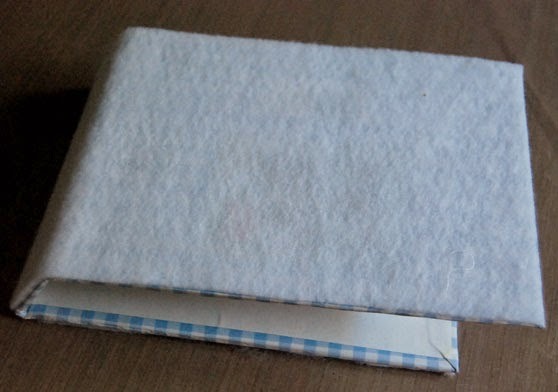 Next I covered both the inside and outside with a layer of woven fabric making sure that I cut it at least 3/4 of an inch larger than the album. I did not use hot glue because it isn't smooth but in the end, the lace may have covered any bumps if I had used it. 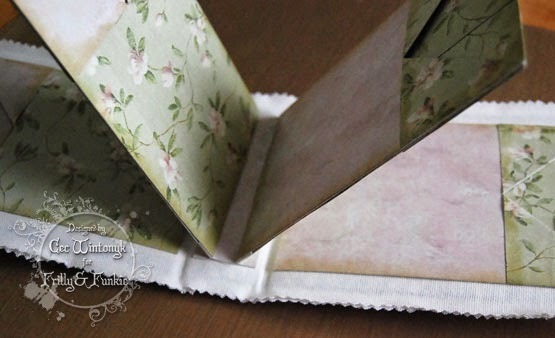 I put the inside cover on first and then ran a narrow strip of double sided tape on the fabric right next to the album edge so that when I added the top cover, I could adhere the two covers together and then the edge would not show. Once the covers were attached I cut the edges down to about 1/2" using pinking shears. 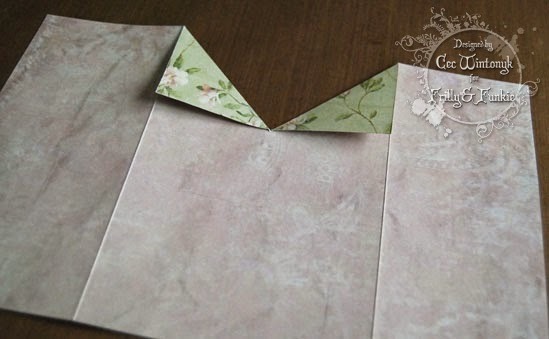 Next I started to make pockets for the inside of the album. I didn't have any double-sided card stock that was large enough so I just found some digital prints in my computer files that I thought would look good together (these are from Far Far Hill) and printed them double-sided on white card stock on my laser printer. Here is a pocket all glued together. 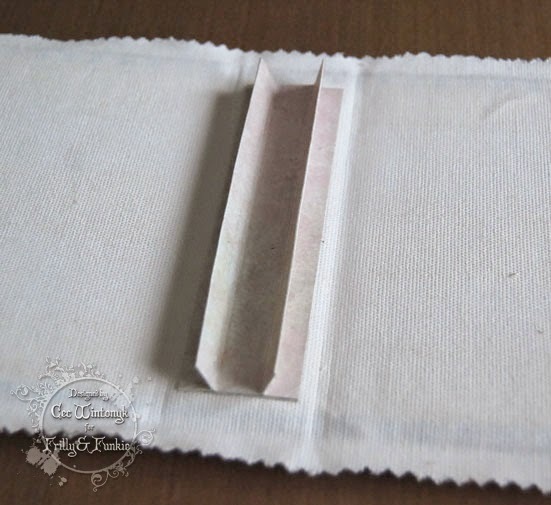 The fold-over flaps and seam at the back are glued down and there is a small strip of double-sided tape on the inside bottom, which makes this a pocket. Next I made a binding system and attached it to the inside of the spine using a strong liquid glue. There is a fair bit of space between so that lots of things can be stuffed into each pocket. Each of the upright strips will have a pocket on each side. The other two pockets will be fastened to the inside of the front and back. The next step was to adhere all the pockets. I started with the pockets attached directly to the covers and then added the pockets to the binding system making sure that they were back to back. After I finished I added an extra top loading pocket to each of the pockets on the insides of the covers but forgot to take a photo of this. Next I made a stacked flower to go on the front. 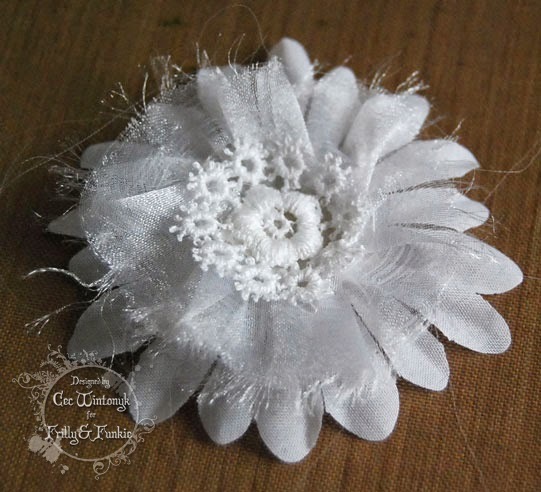 It is just a Prima flower, with a gathered piece of organza and a section cut from a piece of lace I had in my sewing room. I also crocheted a "flower" or medallion to use on the back but didn't take a separate photo of that but you will see it on the album. The next step was to pull a bunch of different Venise laces to work with. The best thing about this project is that you can use little leftover strips and nothing has to match. 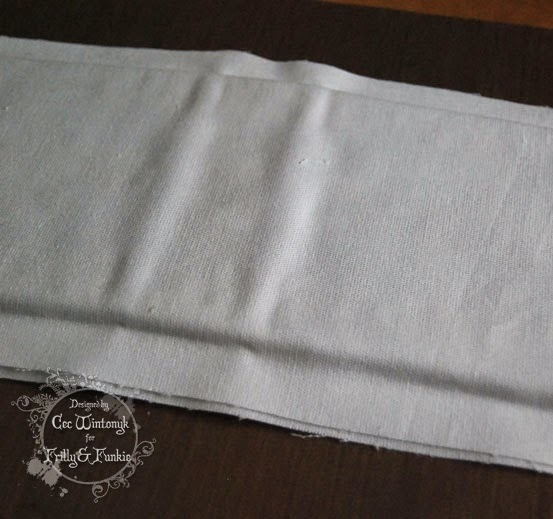 I took some lace hem binding and attached that to the sides of the front and back so that the album can be tied together when it is full. 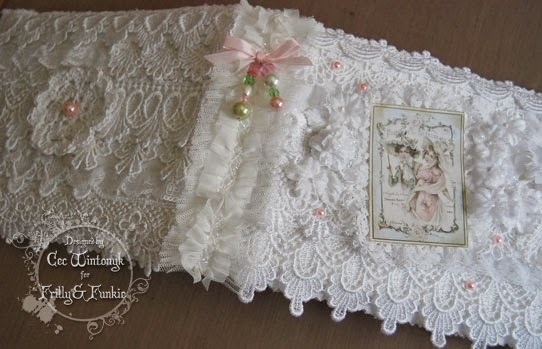 Then I started covering the front and back with lace. At first I tried laying it out to create a pattern and then realized that it looked better if I just dove in and started adding it. 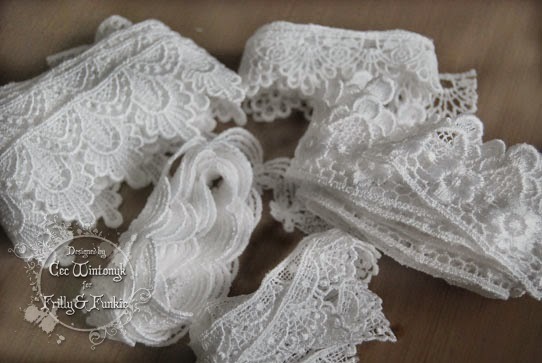 Make sure that your lace overlaps onto the spine by a tiny bit. Once all the lace was added I added a pre-made fancy tulle strip to cover the spine because something vertical looked better than a strip of lace. Then I added the embellishments - the crochet "flower" to the back, a vintage image framed in lace to the front, the stacked flower, a bunch of glittery Prima flowers that had been in a spray but I took them apart and pink pearls here and there. I also made a couple of bead charms and attached them to the spine with a tiny pink bow. It is Trace here as your host for the second week of a new challenge here at Frilly and Funkie. 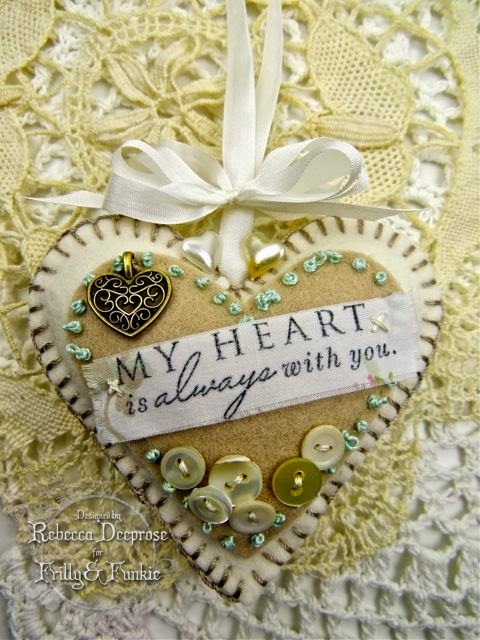 I am thrilled to be choosing the theme this fortnight which is 'From The Heart'. 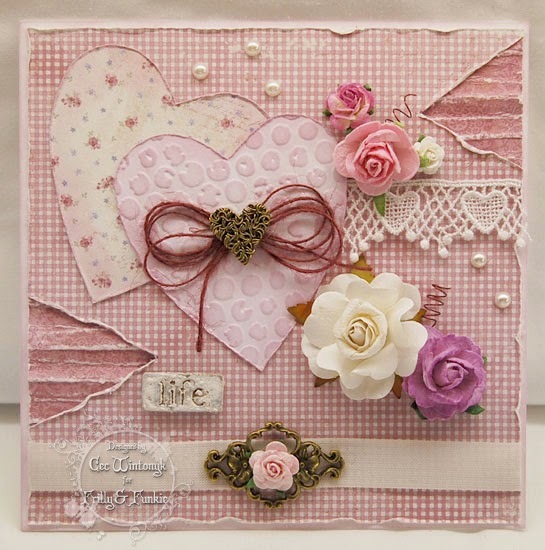 Your challenge is to create a vintage project that has hearts as the focal image; you could make a dimensional piece, a card, ATC or tag, as long as hearts are the main focus. The winner will earn a Guest DT spot here at Frilly and Funkie, and everyone who enters will have the chance to win a randomly drawn $25 spending spree at The Funkie Junkie Boutique. 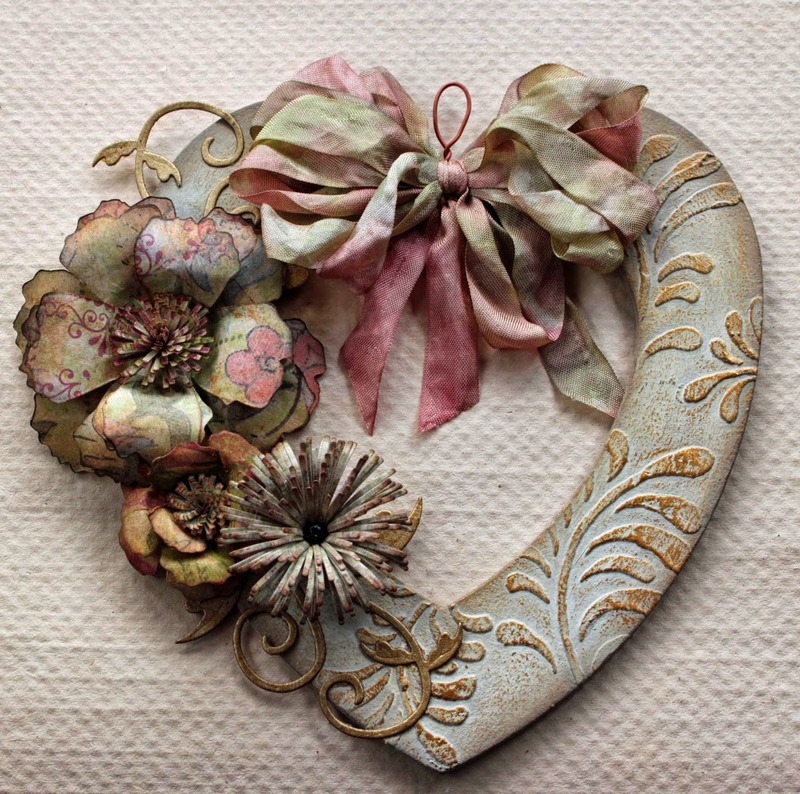 The guidelines for entering are simple: create a new vintage or shabby chic project following the challenge theme, link it up below to your post (not just your blog) and also include a link back to this challenge in your post. You can combine our challenge with up to 10 challenges (including this one) to be in with a chance of winning. Make sure you follow these rules as unfortunately we have had to eliminate entrants from the prize draws in the past when they have entered too many other challenges. If you are entering through a public forum please use keyword F&F. Also, please be sure to turn off your Word Verification so our design team can leave comments on your blogs. Hope that you will find the time to join in the fun and enter your 'From The Heart' piece using the link below. 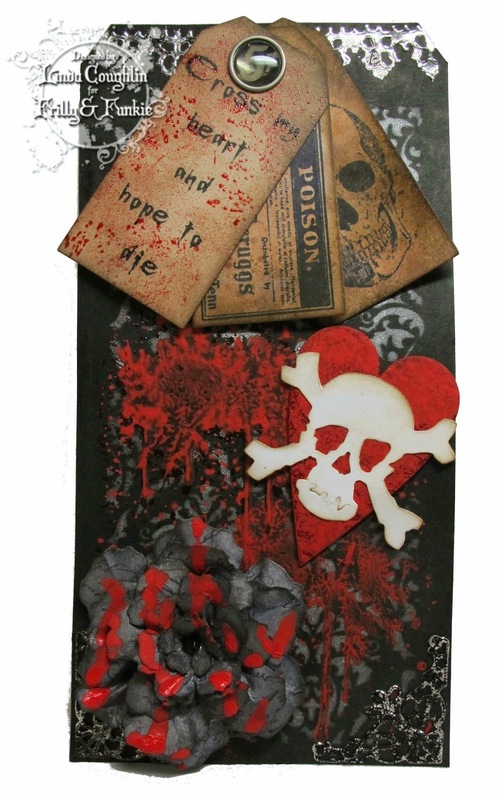 In the meantime we'll be back tomorrow with more inspiration from the winner of a previous challenge, Donna of From My Art 2 Yours, so make sure you check out her fantastic project. So here we are, another Monday, and it's time to announce the winners of the 'A Summer Garden' challenge. Thank you all of those who took the time to enter with some utterly beautiful projects. The standard was exceptional again and we were spoiled for choice when voting. After much deliberation the Design Team picked #2 Bonnie McLain as our winning entry. We loved the multi-layered design and beautiful handmade flowers all demonstrating Bonnie's attention to detail when creating this card. Congratulations Bonnie on being our Funkie Favourite for the 'A Summer Garden' challenge and winning the opportunity to be a Guest Designer here at Frilly and Funkie for a future challenge. And Random.org has chosen a winner for our $25 gift certificate to The Funkie Junkie Boutique. Our congratulations go to #17 Toni of Studio Garage Band. A huge vote of thanks from the Frilly and Funkie Design Team to everyone who took part in this challenge and congratulations again to our winners. Please email Linda at thefunkiejunkie@gmail.com for the codes for the winner's badge and to give us your email address for the Guest Designer details (Bonnie) and for the gift certificate details (Toni). Our current challenge, 'From The Heart' runs through Tuesday, September 23rd. We hope to see you entering this time around so that you too can be in with a chance to win. And remember, you can enter up to 10 challenges including ours, and a maximum of 3 entries per person to our challenge. Please remember to link back to our challenge in your entry and mention in your post that you are entering this Frilly and Funkie challenge. 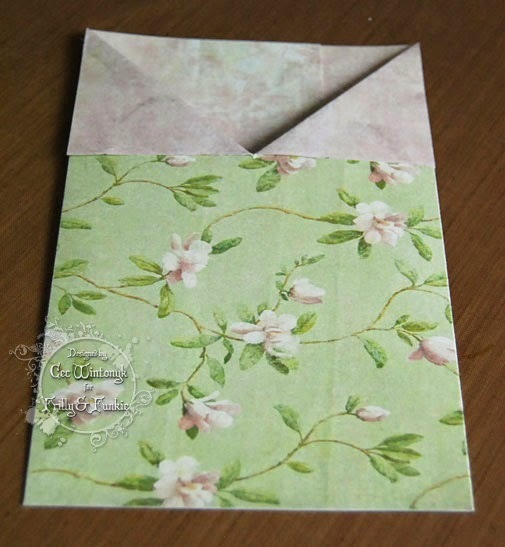 Some paper flowers top the stopper. They remind me of a flowered hat! Some charms finished off the neck. Oh the possibilities! I don't think these will be the last bottle I dress up and I'm thinking they would make great gifts as is, or filled…hmmmmm! I've added a list of the products used from The Funkie Junkie Boutique below so you can play dress up with me too.